It may seem perverse that the first verbs presented in most Spanish textbooks, typically ser and tener, are irregular. In fact, ser is undoubtedly the most irregular verb in the language. Why not start with nice, friendly regular verbs like hablar, comer, and vivir, and deal with the irregulars later? The answer, of course, is that the most frequent, can’t-live-without-’em Spanish verbs are irregular. This is not a coincidence. 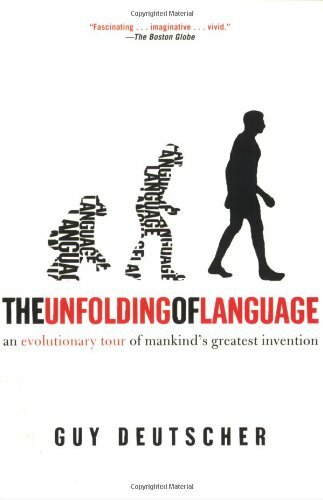 Over time, the natural tendency in language evolution is to reduce irregularity by imposing a language’s normal patterns on previously exceptional forms, a process called analogy. 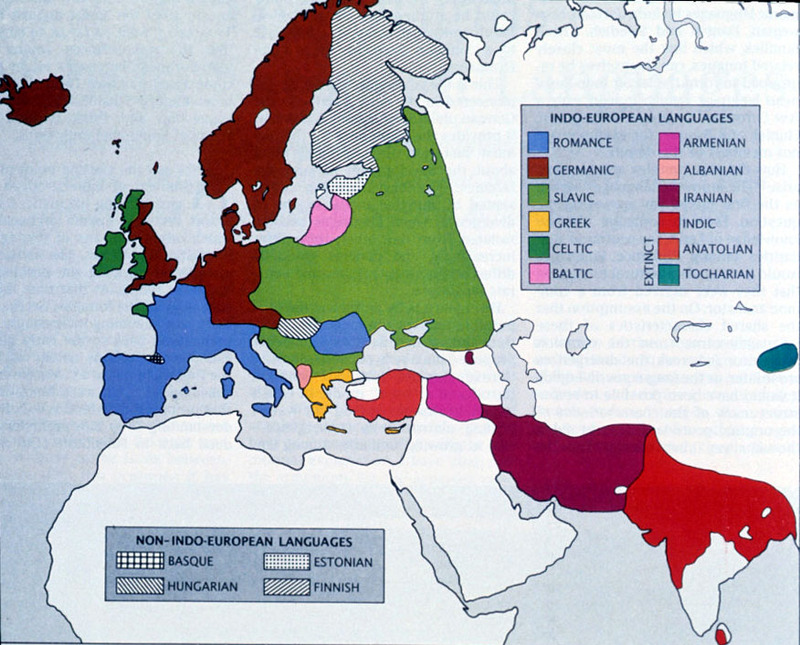 That’s how English ended up with regular past tenses like helped in place of the Middle English form holp. Only the most frequently used words are able to resist analogy and maintain their irregularity. Actual verb frequency data are impressive. 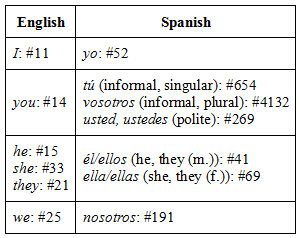 The table below shows the regular and irregular verbs among the 100 most frequent Spanish words, as cataloged in Mark Davies’s A Frequency Dictionary of Spanish: Core Vocabulary for Learners. The dozen most frequent verbs are all irregular. 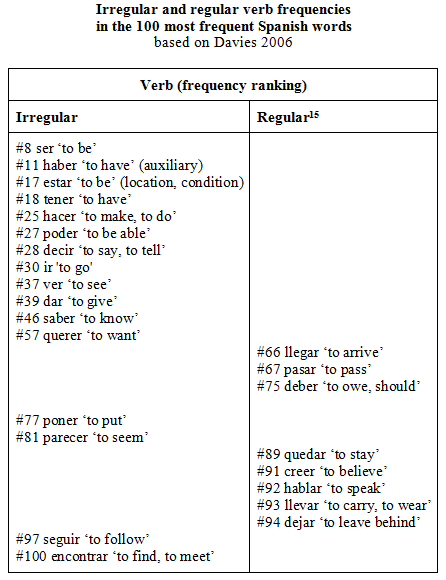 The most frequent regular verb (llegar ‘to arrive’) appears more than halfway down the list, and irregulars remain common throughout. I’ve counted llegar and creer as regular verbs, by the way, because their spelling complications (like the u in llegué and the y in creyó) are completely predictable given the rules of Spanish pronunciation and spelling. Because Spanish splits ‘to be’ into ser and estar, and ‘to have’ into haber and tener, the English versions of these verbs are of higher frequency. According to Mark Davies and Dee Gardner’s A Frequency Dictionary of Contemporary American English: Word Sketches, Collocates and Thematic Lists, ‘to be’ is #2 in English, and ‘to have’ #8. Another comparative goodie concerns subject pronouns. As you might expect, since Spanish usually relies on conjugation alone to say who did something, its subject pronouns are further down the frequency list than are those of English. See the comparison below. Overall, it’s surprising how much information one can glean from these lists. Muchas gracias, Prof. Davies. This entry was posted in Verbs, Vocabulary and tagged Dee Gardner, English word frequency, irregular verbs, Mark Davies, Spanish, Spanish word frequency, subject pronouns, word frequency on 26 February, 2014 by jhochberg. While researching the origin of the three conjugation classes of Spanish — ar, er, and ir — I recently turned to the lovely folks at the wordreference.com Spanish-English vocabulary forum to help me think of pairs of Spanish verbs that differ only in their conjugation class. The only two I had thought of were sentar/sentir and crear/creer. These pairs are a nice reminder that the conjugation classes, by themselves, are void of meaning. Please see my original post (link above) for an example of a language (Hebrew) where the same verb root can appear in more than one conjugation class, with each class adding a predictable nuance to the verb root’s core meaning. Here is my full list, which I will continue to edit as I learn of more. Note that there are no triplets on the list, and that all the pairs contrast -ar with either -er or -ir. This may be a coincidence, but the fact that -er and -ir verbs have almost identical conjugations (the only difference is in the nosotros and vosotros present indicative) would make triplets or an -er/-ir contrast hard to learn and to maintain. Please let me know if can think of any more. rendar/rendir (render is also in the RAE, but only as an antiquated form of rendir). 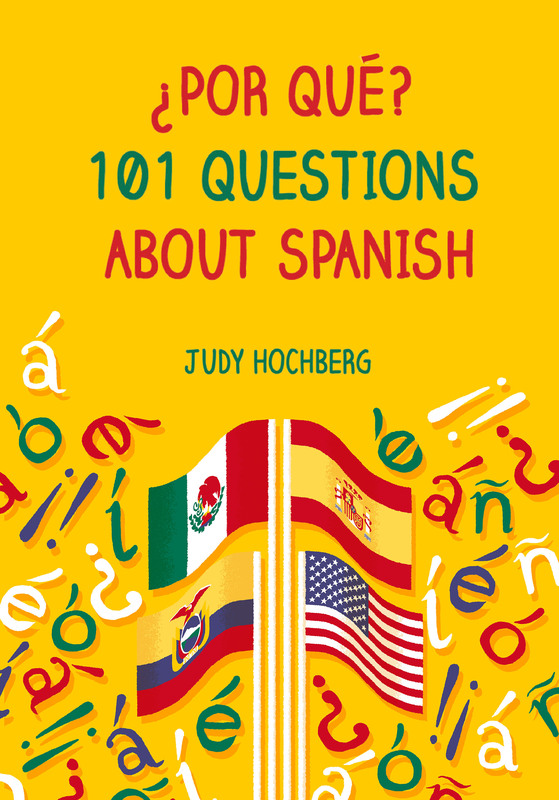 This entry was posted in Verbs and tagged binyanim, Spanish, Spanish conjugation classes, Spanish conjugations, Spanish verbs on 5 February, 2014 by jhochberg.